Located in the middle of Groton State Forest, in Groton, Vermont, Big Deer State Park offers many activities for the nature enthusiast. 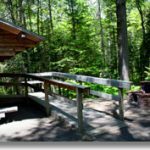 At a cost of $16 to $23 dollars, the park is affordable for almost any budget, from a family outing to an individual interested in taking in some sights and doing some hiking on the trails. Big Deer State Park, as well as the surrounding Groton State Forest, hold a rich history. The Abenaki tribe of Indians hunted and camped in the area for centuries and soldiers and explorers used the area as a connection point between the Winooski and Connecticut Rivers. Until the American Revolutionary War, there were no permanent settlements in the Groton area, leaving the beautiful wilderness untouched by humans. As a result of the railroad industry expanding across the United States in the early 1900s, the logging industry followed suit, exploding in the Groton area. This left many of the forests bare of virgin wilderness, leading to the creation of protected land, such as Big Deer State Park. Shortly after, railroads no longer brought loggers, but instead brought campers and tourists to the area, leading to the modern day beauty of Big Deer State Park. As for camping, Big Deer State Park offers 23 tent and trailer sites, as well as 5 lean-to sites. The park offers restrooms with hot showers (at an additional cost.) As far as sanitation, campers have access to a dump station, but there are no direct hookups at the camp sites themselves. For those how don’t fancy sleeping in tents on the ground, Seyon Lodge offers a bed and breakfast experience while still maintaining a rustic feel. Big Deer State Park also offers many historical sites to visit, including the Montpelier and Wells River Railroad. Visitors can still see the railroad ties sticking through the green moss, harkening back to a time when trains traveled the tracks twice a day to deliver trees to be made into lumber. Visitors to Big Deer State Park can also visit Peabody’s Mill, which existed as a steam powered mill that helped to power the logging industry in the area. For hiking enthusiasts, Big Deer State Park offers 11 different trails, many of which take hours to complete. The trails range in difficulty, so beginners and experts alike can find a challenging new experience. Hikers will delight in the spectacular views from Owl’s Head Mountain, while marveling at Peacham Bog Natural Area, one of the largest bogs in Vermont. Big Deer State Park is a year round access park. In the Winter, snowmobiles can be heard through the trees as guests and nearby residents glide through the brilliant white snow. In the Fall season, aside from offering perfect hiking weather, the forest allows hunting. Visitors are encouraged to wear brightly colored clothing to avoid potential hazards. In the Spring, visitors can become awe struck when taking in the beautiful sights, smells, and sounds of the forest once again emerging from hibernation. This time of year at Big Deer State Park has become a favorite among visitors and locals alike. The Summer season ushers in campers and hikers from all across the world, all wanting to take part in the brilliant majesty that the park offers. For even more fun, Big Deer State Park also offers swimming during the Spring and Summer months in both Ricker Pond and Stillwater. If you’ve never been swimming in a natural lake, you don’t know what you’re missing. Visitors even have access to horse camping at New Discovery. Keep your eyes out for moose and your ears open for the sounds of loons in the distance as you truly experience the great outdoors. Whether you’re looking for a quiet place to find yourself, or a spot for a fun and adventure filled family vacation, Big Deer State Park has what you’re looking for. From amazing wilderness to historical attractions, as well as mountains, ponds, and valleys, Big Deer State Park is sure to offer you amazing memories while leaving you with many stories to tell to friends and loved ones. For more information, the park can be reached at 802-584-3822. To visit the park’s website, please go to www.vtstateparks.com/htm/bigdeer.